George knew he had Stage 4 lung cancer for only one month, but by then it was too late to fight. In June, he felt lousy with a cough, chest pain and fatigue. After a chest x-ray, his primary care physician Dr. Joanne Lepkowski ordered a CT Scan. When she got the results on July 12, she told us he had a malignant mass in his lung. On July 15, we celebrated Sam's 17th birthday. A few days prior to that, George's primary care doctor had told George there was a mass on his lung, but it would take another six weeks before we met with an oncologist. We met with a thoracic surgeon Axel Joob (pronounced Jobe) on July 18. He said he wasn't so sure about the cancer and ordered a PET scan. He said the mass was concerning but he wouldn't say cancer (as the radiologist had reported to our primary care doctor) without more tests. George had seen this doctor before because of two inert nodules in the lungs. Those never changed over the course of a few years. George had the PET scan on July 26. A few days later, Dr. Joob said it showed "activity" in shoulder, hip and pelvic bones, as well as the lung. George's shoulder had been hurting a lot in the summer; we thought it was arthritis. 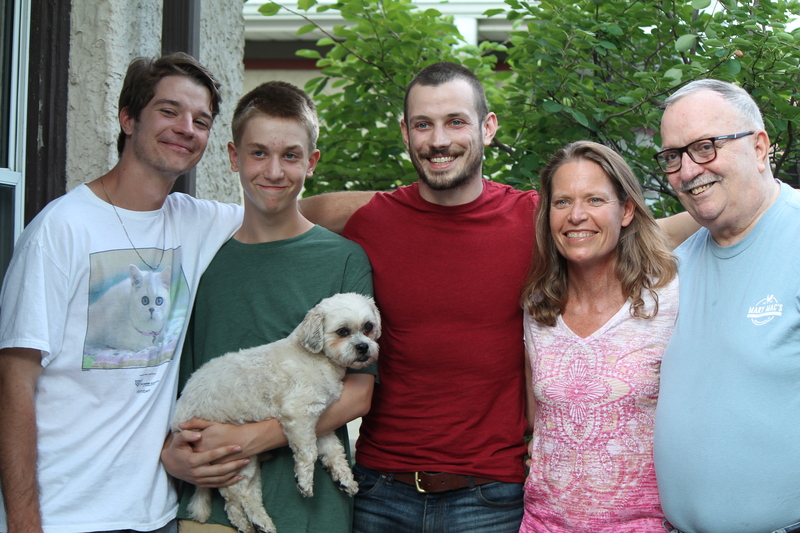 On August 8, George had a biopsy of some bone lesion cells near the base of his spine. The doctor said it was the easiest of the three places to get the sample. On August 15, Dr. Joob said the biopsy showed cancer in the bone areas, which came from the cancer in his lung. He said we'd see the oncologist, Dr. Mebea Aklilu, at Illinois Masonic, the following week and hear more about the cancer and treatment options. Dr. Joob also referred George to Dr. Santosh Yajnik, a radiation oncology doctor, for some radiation in the shoulder area, for George's pain. 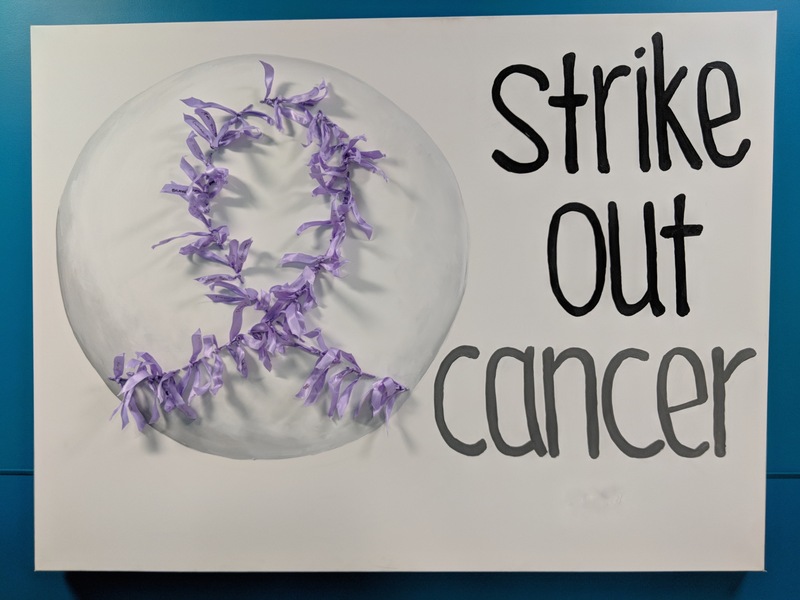 Cancer/baseball art at the Illinois Masonic Cancer Center. This seemed like a good sign when I saw it, since all three of George's sons are excellent pitchers.On August 22, we met with the radiology oncologist and the medical oncologist, their nurses, and a palliative nurse practitioner at the Cancer Center at Illinois Masonic. It seemed like a good place with good people. Our insurance, through the Chicago Board of Education (fought for by the Chicago Teachers Union) seemed good. The medical oncologist Dr. Aklilu said George had Stage 4 lung cancer that had spread to several areas in his bones (shoulder, spine, hip, pelvis) and lymph nodes. He said the average life expectancy with treatment is one year or two, depending on the kind of cancer cells and how the cancer could be treated. He said we'd determine what treatment to do to control the cancer, which he he said was probably incurable, in two weeks after the lab has looked at the biopsy sample. The doctor said they'd be looking for proteins or mutations – to determine the systemic treatment, whether he'd receive chemo or something else. The doctor said the cancer was the small cell variety and is amino carcinoma (from the glands). He said it was not typical that George's small lung tumor metastasized to his bones so quickly. The radiation oncologist Dr. Yajnik ordered five courses of radiation in the shoulder and near his tailbone, with the goal of easing George's pain. The palliative nurse prescribed slow release morphine and hydrocodone as needed for breakthrough pain and medicine for his cough. On August 23, George drove himself to the Cancer Center, accompanied by our youngest son Josh, who helped George during his radiation "planning session." George had his first radiation appointment on Friday, August 24. We felt pretty happy to begin doing something after being pretty sure for six weeks that he had lung cancer. On Tuesday, August 28, on our way to his third radiation appointment at 1 p.m., George started breathing heavily, couldn't speak very well and seemed agitated. Our nurse had warned us about dehydration. At the time, I thought that's what happened and why he got sick. He had barely eaten any food for many days and he had drank very little while taking so many pain meds and getting the first two doses of radiation. When we got to the hospital, instead of his treatment, the radiologist nurse and doctor sent us to the ER. We were there from 2 p.m. to midnight. The ER staff didn't want him to stand. It was a terrible experience; he was hurting so much. Before cancer, George had a lot of pain in his back. He had stenosis, for which he'd been treated in 2001 with a laminectomy, but over the years the pain had returned. He took pain killers and received an every-three-month spinal epidural. Being on his back that whole time in the ER really hurt him, but it seemed like the IV fluids and oxygen helped his conditions. On Wednesday, August 29, he had a radiation treatment and stayed another night in the hospital and had another radiation appointment on Thursday, August 30. The CT scan showed more lesions in his liver. He also had an MRI of the brain and an ultra sound of the heart. The neurologist said he's had small strokes. The cardiologist said he's had heart attacks. On Friday, August 31, George's sons Danny and Sam took George for his final radiation appointment. For the next few days, George was weak, fatigued, and sometimes depressed. He had no appetite and didn't eat much. He had a lot of pain in his shoulder, lower back and chest. But at one point after a nap and some juice, he felt better. He was determined to fight the cancer. "It's like Stalingrad," he said. "You have to stay in it to win it." We had assumed that when we'd meet the oncologist again on Sept. 5, he would tell George about chemotherapy. Instead, the doctor said George was too weak because of the strokes he had been having. He suggested hospice care. George's goal was to get stronger in order to receive chemotherapy. 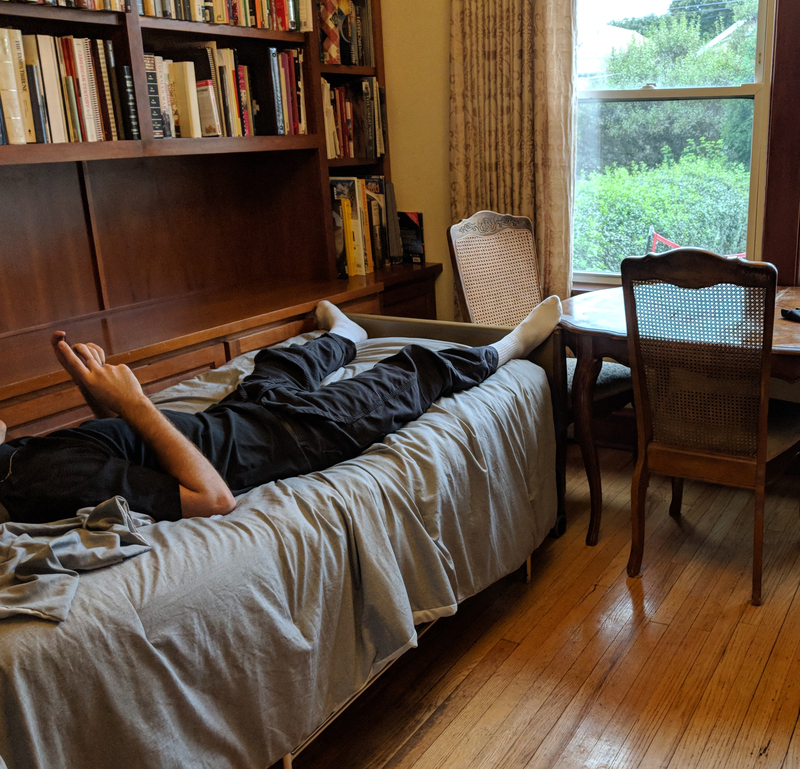 George never tried out the hospital bed we obtained in September.I had gotten a hospital bed for our first floor, but George never used it. Even while he was in pain and walking with great difficulty, he still climbed the stairs to take naps and sleep in our bed on the second floor. He was able to walk to the washroom by himself. During his last days, George's sons, our dog and I were with him around the clock, trying to help him stay comfortable. But for many days wasn't able to eat or drink. His breathing was loud and labored until it stopped at 12:30 a.m. on Monday, Sept. 17.